I’m sure some of you will be thinking, “About bloody time!” I don’t blame you; it’s great to cut to the chase and get on with doing what you need to do. Three or four years ago I wanted to make a small cold frame to keep the frost off my seedlings. There was this old wooden door I had been saving for the occasion; it was getting a bit rotten at the base and had taken a bashing from the winter rain where it leant on its side next to the wood pile. I also had a few other timbers, some hinges and a bucket of long screws that had been salvaged from a wooden shop display a relation had been asked to remove. 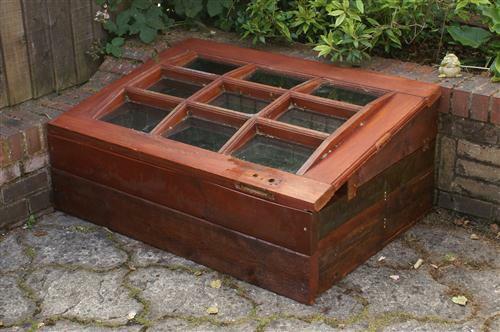 For weeks the cold frame remained unmade; just a load of churning plans in my head. I’m lucky that I can think in three-dimensions, but twisting the models around in my mind seemed to make no difference to my self-imposed recalcitrance. Then one day, as the sun shone down and the patio finally dried out, I grabbed hold of (or rather wrestled with) the door, took out a saw and the Workmate, and cut a lump off the bottom of it. Within two hours the basic structure had been made, screwed in place and I was looking for some wood preservative in the shed. The cold frame was dry that evening. Here’s a picture of it. It wasn’t a masterpiece of the joiner’s art and would later on need some clear plastic over the panes to stop water pooling in the door, but the point of this vignette is to explain something about the way problems are solved. The obvious conclusion is that I just needed a reason to get on with the project and should have got off my arse a bit sooner. The reality is that without those weeks of rotating a wireframe drawing in my head, subliminally pondering points of stress and how to ensure the structure would last for longer than up to the next high wind there is no way I could have “just” grabbed the door and got on with it. Time had to be spent getting the idea right otherwise I might have just ended up with a cludge – a top-heavy, structurally unsound folly that jammed on the wall as it opened and fell apart the moment one of my lovely children decided to perform a dance on top of it. When faced with a problem such as how to undermine the Tools of Disconnection there are an awful lot of structures to put in place; all sorts of connections to make and tools to assemble; and a hell of a lot of careful thinking to do. As it stands, how much living do we have in our lives? How many mornings do you wake up feeling truly free, thrilled to be alive, breathlessly anticipating the experiences of a new day? How many nights do you fall asleep feeling fulfilled, going over the events of the past day with satisfaction? Most of us feel as though everything has already been decided without us, as if living is not a creative activity but rather something that happens to us. That’s not being alive, that’s just surviving: being undead. We “like” fast food because we have to hurry back to work, because processed supermarket food doesn’t taste much better, because the nuclear family – for those who still have even that – is too small and stressed to sustain much festivity in cooking and eating. We “have to” check our email because the dissolution of community has taken our friends and kindred far away, because our bosses would rather not have to talk to us, because “time saving” technology has claimed the hours once used to write letters – and killed all the passenger pigeons, besides. We “want” to go to work because in this society no one looks out for those who don’t, because it’s hard to imagine more pleasurable ways to spend our time when everything around us is designed for commerce and consumption. Every craving we feel, every conception we form, is framed in the language of the civilization that creates us. Does this mean we would want differently in a different world? Yes, but not because we would be free to feel our “natural” desires – no such things exist. Beyond the life you live, you have no “true” self – you are precisely what you do and think and feel. That’s the real tragedy about the life of the man who spends it talking on his cell phone and attending business seminars and fidgeting with the remote control: it’s not that he denies himself his dreams, necessarily, but that he makes them answer to reality rather than attempting the opposite. The accountant regarded with such pity by runaway teenage lovers may in fact be “happy” – but it is a different happiness than the one they experience on the lam. If our desires are constructs, if we are indeed the products of our environment, then our freedom is measured by how much control of these environments we have. It’s nonsense to say a woman is free to feel however she wants about her body when she grows up surrounded by diet advertisements and posters of anorexic models. It’s nonsense to say a man is free when everything he needs to do to get food, shelter, success, and companionship is already established by his society, and all that remains is for him to choose between established options (bureaucrat or technician? bourgeois or bohemian? Democrat or Republican?). We must make our freedom by cutting holes in the fabric of this reality, by forging new realities which will, in turn, fashion us. Putting yourself in new situations constantly is the only way to ensure that you make your decisions unencumbered by the inertia of habit, custom, law, or prejudice – and it is up to you to create these situations. Freedom only exists in the moment of revolution. And those moments are not as rare as you think. Change, revolutionary change, is going on constantly and everywhere – and everyone plays a part in it, consciously or not. “To be radical is simply to keep abreast of reality,” in the words of the old expatriate. The question is simply whether you take responsibility for your part in the ongoing transformation of the cosmos, acting deliberately and with a sense of your own power – or frame your actions as reactions, participating in unfolding events accidentally, randomly, involuntarily, as if you were purely a victim of circumstance. So forget about whether “the” revolution will ever happen – the best reason to be a revolutionary is simply that it is a better way to live. It offers you a chance to lead a life that matters, gives you a relationship to injustice so you don’t have to deny your own grief and outrage, keeps you conscious of the give and take always going on between individual and institution, self and community, one and all. No institution can offer you freedom – but you can experience it in challenging and reinventing institutions. When school children make up their own words to the songs they are taught, when people show up by the tens of thousands to interfere with a closed-door meeting of expert economists discussing their lives, that’s what they’re up to: rediscovering that self-determination, like power, belongs only to the ones who exercise it. There are fourteen Tools of Disconnection listed in Chapter 2, along with something that acts to protect these Tools from detection. That’s not all: there are all sorts of potential variations on these Tools, as well as other discrete areas you might have already thought of, and could have been put in the list given enough time and space. To give one example, there is something we might call “Control Our Food”, which is pretty much what is imposed upon anyone who lives in a city or suburb, or anywhere else where there isn’t ready access to or the desire to grow or otherwise produce edibles. What about, “Take Away Our Creativity”? Art and the innate desire to create beauty are managed by industrial society as a predominantly commercial form of expression, putting the lid on more esoteric and impulsive desires. But both of these can be considered in the context of other Tools of Disconnection, such as Pretend We Have a Choice, Sell Us a Dream and School Us. Further, there is a lot of crossover between the listed Tools themselves, making isolation for the purposes of undermining a tricky job. That is why we have to look beyond the individual Tools and consider the whole. The point of listing the Tools of Disconnection was to establish the battle lines. This is what we are up against: a sprawling, many-limbed creature that smothers and snips as we push through and connect. Swirling around all of this is the Veil of Ignorance: now that is something we can consider in isolation, and indeed will; but as far as the wider Tools go, they have to be looked at as this horrible creature. It has strengths as well as weaknesses. Some of us can go for particular weaknesses; others can use their expertise to attack the more resilient parts of the creature. It may morph into other things; it may multiply, grow stronger under pressure, or weaker when it doesn’t feel threatened. We have to be prepared. Time to let go of the analogy. I think it’s clear what we are faced with and now we need to do some serious thinking on the ways to deal with it. It seems sensible to break the solution down into the different aspects of civilized humanity that have become disconnected, starting with the larger scales and then moving much closer to home, in many ways just to make it clear we matter individually and in small groups just as much as the wider human race does. That will form the basis on which the second half of this book is structured. Now there is the matter of creating a Game Plan – something that can be used in a wide variety of situations; easily adaptable and just as importantly, easily understandable to everyone who is going to make use of it. No plan will cover every eventuality, and like my oversight that meant the water pooled in the cold frame door, sometimes you have to make adjustments at the last minute. Sometimes you have to think on your feet, be instinctive, throw the game plan out of the window. But if we can construct something good enough then for the most part it should prove useful for the task to come. What can you do? I ask this with earnestness that approaches concern. Watching the movie (or, if you are a purist, reading the graphic novel) V for Vendetta provides a salient excuse not to get involved in anything too testing: lacking a brilliant tactical mind, technical expertise and a host of combat skills puts the observer very much in the category of a participant of the masked mass that march on Parliament then stop, awaiting the explosive denouement with hope. I think that’s a failing on the part of the observer; not in any lack of ability, but in misreading the essence of the tale. The character “V” is an image of rebellion – a gestalt of the many elements required in wider society to bring down a destructive and oppressive culture. Parliament itself is a symbol of the system that destroys and oppresses. These two elements together imply that no one act is sufficient to do the job; no one successfully executed task will undermine the Tools of Disconnection on its own. Many people need to do many things upon many targets. That should help put into perspective the onus which is upon each Underminer. I am not “V” and neither are you; we are. As you will see later in the book, there are actions big and small, complex and simple, high profile and low profile, long-term and quick-win which are all valid parts of the itinerary of an effective Underminer. Where you fit into this will be determined by numerous factors of timing, ability, connectedness and patience, to name but a few. That said there are certain attributes we as Underminers should consider vital constituents of our metaphorical Toolbox. Owing to personal circumstances, not everyone will be able to make the grade in every area, but we can all at least be moving towards being the best we can. It is certainly not the case that you will be spending all your time running from safe house to safe house, pausing only briefly to scale a downpipe and traverse a pitched roof in the lashing rain, but nevertheless physical fitness is an important factor in many actions where at least a semblance of mobility is required. It is also allied closely to mental alertness and wellbeing. You should keep yourself in good condition, regardless of anything – you never know when you will need it. Mental fitness is, if anything, more important than physical fitness. There are many activists who, by necessity, cannot take a physical part in certain types of activity but are valuable contributors in many other often extremely important ways. Having a fit and agile mind, a positive attitude and a range of mental capabilities that can be called on when mere physicality just won’t cut it are vital to successful undermining. If physical and mental fitness are the nuts and bolts, stamina is the locking washer that provides continual strength without expending too much energy. Some people can walk for a day without stopping but can barely run 100 metres; others can stay focused on a complex mental task, but would struggle to learn a new skill. Stamina allows you to carry on with something when others, in particular those that would seek to stop you, are unable to go on. It is impossible to overstate the value of empathy, yet empathy is often considered to be a sign of weakness or softness in activist circles. This is wrong. Empathy requires a level of connection with others to the extent that, when it fails, the entire venture can collapse. Consider its usefulness in building and maintaining support for something; assessing whether someone is genuine or a “plant”; being able to convince a target you are on their side. These are wildly different applications of the same vital attribute, all of them relevant to undermining. Where empathy allows true connection to another individual, communication tends to be more superficial, but wider ranging. A capacity for good communication might include having the ability to speak to groups of people, even entire nations; writing convincing copy, possibly as an alter ego; building social networks of willing supporters, and producing works in a variety of forms in order to express an idea. It is, at its root, about transmitting something from the few to the many. Mental fitness may provide the womb in which ideas gestate, but without creativity being present then the ideas may be unfit for purpose. There is nothing wrong per se with using an existing idea, or dealing with a problem in a known way, but the industrial system is – by economic necessity, as much as anything else – always finding innovative ways to control people’s lives. We have to innovate in return: not merely to stay ahead of the game, but to work out how to bring a constantly changing enemy down. Some things come only to those who wait. If you have a really good idea then you should stick with it, but the opportunity to execute that idea may be very narrow – perhaps one day in every four years, as a very obvious political example2. By all means work on something else while you are waiting, but don’t miss that opportunity simply because you couldn’t be bothered to wait – next time whatever good idea you had may no longer be applicable – and certainly don’t imperil yourself because you were too hasty. While patience is enduring passing time in search of a moment, tenacity is enduring a constant barrage of moments that can easily knock you off course. Like the budding writer that keeps on submitting her work, knowing that to stop is to fail, the tenacious Underminer will only stop when to continue would be of no possible benefit. This is particularly relevant in the early stages of the undermining process – the boring bit, if you like – where the hundred-and-first memo is the one that bears fruit or the fiftieth phone call is the one that puts you through to the right person. Allied to tenacity is the importance of not letting details slip by. At all points in the undermining process, right up to any tidying up that is necessary, a single detail may make the difference between success and failure. This is one area, and there are many others, where teamwork can be crucial: while one person may be focused on getting the job done, another should be making sure nothing has been missed. If you can maintain an attention to detail while also seeing the bigger picture then you are truly blessed. We all have instinct, and most of us ignore it. The gut feeling that something is too risky, going wrong or needs a last minute adjustment is not just innate, it is borne of experience and knowledge. By ignoring instinct you are ignoring a lifetime of learning. I would much rather trust the instincts of an experienced hunter in knowing today is not going to be a good day than waste time and energy on a futile search for food. Undermining is, at times, seat-of-your-pants stuff, so pay attention to your instincts as they might be more right than any bloody minded determination to follow the script. You have probably noticed that there are all sorts of things missing from this list: skills such as computer expertise, linguistics and engineering. They are not missing. The Toolbox is replete with all of the things necessary to acquire all of those skills and virtually anything else you might need.3 Admittedly some of those skills may take far longer to acquire than you have time for, but many of them are within reach of anyone with the necessary attributes. I really can’t see me learning how to strip a car engine down any time in the next couple of years, but the attention to detail acquired through writing will be useful in learning how to produce any number of fake press releases. It is a truism that ninety percent of a successful outcome is in the planning, but equally true to say that most of the fun is in the execution. The act of undermining may have deadly serious intentions but it doesn’t have to be a grim exercise, carried out with the weight of humanity riding on your shoulders. It might feel like that sometimes, but it isn’t really. Nevertheless if we are to do such an important thing then we had better do it properly. With the Toolkit in place we now have to look at the different Phases of any game plan. This consists of five discrete areas; not all of them essential to carry out in all cases, but nonetheless very important to be aware of, especially if you are doing this as part of a team. The five phases are Identification, Investigation, Exposure, Execution and Housekeeping. To take a real world example, the process of hacking a computer system is, in the vast majority of cases, not just a simple smash and grab. If you take that approach then (a) you will probably fail in your task and (b) if you do “succeed” then you are almost certain to get caught. In reality, hacking is a purposeful, methodical process that requires a great deal of preparation and expertise. First, the target must be carefully identified as that which you are going to perpetrate the hack upon; not just whether it is the intended target, but whether it is also a worthwhile one. Second, the target must be “scoped” in order to ascertain exactly how you are going to carry out the attack, what skills are required, how much time you need, when is the best time to carry it out, and so on. This is also the stage during which you decide the trigger points for calling off the hack or continuing. The third phase is not commonly used in hacking, but there may be occasions when exposing the target as, say, an easy hit are sufficient to complete your task. Next is the actual “hack” itself: getting in and doing whatever you intended to do. This is perhaps the “fun” bit, although the risk of getting caught at work is not fun for everyone. Finally, and often overlooked, is the housekeeping phase, where any evidence of your activities need to be appropriately dealt with. You may wish to leave a stain on the system of your target, but it’s unlikely you will want the target to know who left that stain, nor how the hack was actually carried out – after all, you may want to do it again. Notice, I have not taken any moral stance on whether hacking is the right thing to do or not. Morals are different from legal matters. As we will discuss in the next chapter there are certain actions that transcend mere legislation which, after all, is only in place to satisfy the will of the industrial system. Note: This section provides no more than guiding principles for the different stages of undermining; unless you are a veteran activist then you will need a lot more information than this, which is what Part Two will endeavour to provide. Knowing our enemy wasn’t the only reason to list the Tools of Disconnection in such detail; there is also the matter of being able to identify when one of these Tools is being applied to us as individuals, a community, a society…the entire human race. If you have a moment go back to Chapter 2 and scan through the different Tools one more time, pay particular attention to the means of identification. What is immediately obvious is they can be boiled down to just a few key things. Actually they can all be boiled down to just one thing – Industrial Civilization – but that’s not particularly helpful. We need to be able to specifically identify when a Tool is being used in a particular situation so as to judge the relevance and importance of any action against the target. As you will see in the next chapter, this is critical given the vast number of symbolic targets often existing for the sole purpose of keeping people from acting against those targets that really matter. •	The meanings of common words and concepts are changed to suit the needs of the dominant culture. Here is a situation you are likely to come across at least a few times in your life. An election is taking place in your country. There are two main parties, along with a scattering of other parties and independent candidates. The two main parties divide along their normal lines, one seeming to appeal to people in blue collar (manual) work; the other to those in white collar (office-based) jobs. Other divisions also exist on various ethical and ideological grounds, further dividing the electorate. A third party emerges that appears to provide a more radical alternative, giving less power to corporations by promising more environmental regulation and workers rights, while also handing many of the powers of central government to regions / states . The third party has a huge advertising budget and looks to be splitting the popular vote in many areas, making way for an alternative. The third party is also driven by a rapidly growing grassroots movement, based on blogging and viral promotion. Some independent candidates claim this is just another mainstream party promising things they cannot deliver, and only independents can truly represent the will of the people who are quite frankly fed up with mainstream politics completely. There is a deep recession taking place and the independents say only their types of ideas can pull the nation back into recovery from the messes the mainstream parties always seem to leave behind. 1. Elections are a form of symbolic empowerment that rarely cause fundamental change except, possibly, where a formal dictatorship has been in operation. is taking place in your country. 2. Countries, regions and states, as opposed to non geographic nations or tribal lands, are created by the imposition of artificial boundaries, usually along with a synthetic national identity. 3. Political parties in large scale elections can never be representative of the needs of a people; they will always be a vague approximation. along with a scattering of other parties and independent candidates. The two main parties divide along their normal lines, one seeming to appeal to people in blue- ollar (manual) work; the other to those in white collar (office-based) jobs. 4. “Representation” is framed in terms of everyone identifying themselves as a particular type of worker in a paid job. This even applies to so-called Communist (Marxist) systems. Other divisions also exist on various ethical and ideological grounds, further dividing the electorate. 5. Most of these divisions exist not for any practical purpose, but to give the impression of choice. 6. Terms such as “environmental” and “rights” are rarely defined. Also, what does the small print say? while also handing many of the powers of central government to regions / states. 7. This may be genuine, but it may also be “divide and rule” in operation. 8. This begs the question of where the money has come from. and looks to be splitting the popular vote in many areas, making way for an alternative. The third party is also driven by a rapidly growing grassroots movement, based on blogging and viral promotion. 9. Is this genuine grassroots support or is it an “Astroturf” operated by the party’s real beneficiary? 10. How can they be independent if they are determined to be part of a hierarchical political system? 11. Economic growth is a given in the case of all parties and all candidates. from the messes the mainstream parties always seem to leave behind. First thing to point out is that this is not a textual analysis, but a situational analysis: it is making you question every situation you are faced with, regardless of its form. Obviously the analysis raises a lot more questions than it answers, and that’s the point. By identifying where the Tools of Disconnection are being applied in any situation what you are doing is focusing on the real issues at hand rather than the distractions which are likely to lead you into a dead end, and an awful lot of wasted time and effort. By analysing the situation in some detail the simple question “What do you do?” has been transformed from a puzzle into a set of undermining opportunities. Without investigation you have little or nothing to back up any claims you make, nor will you be sure of the accuracy of the information you might be using later on. Furthermore, you may be in danger of going too deep into a situation you have no control over. To take the earlier example of the computer hack, many systems contain what are known as “honeypots” that positively encourage hackers to try out their skills, and which are diligently recording the details of everything that is taking place. Honeypots sometimes also contain false information, leading the hacker to believe they have struck gold when they have in fact just struck a brick wall. Good investigation will help avoid the situation where time and effort are expended spooning the contents from a honeypot or, in more general terms, taking on a target in a way that is going to become more trouble than it is worth. With specific reference to physical direct actions, which can take a huge variety of forms, it goes on: “If anything goes wrong – if security guards or the police turn up, if you set off all the alarm systems, or if you hurt yourself and need the quickest route out – it is planning the hit that will save you from ultimate imprisonment and the curtailing of your sabbing career.” As I stated earlier, I take no moral stance with regards to whether an activity should be carried out on legal grounds or not. Ultimately that is up to the perpetrator. Prior to embarking on the investigation proper, you should get some understanding of the nature of your target’s operations: if it is a company, public body, charity, religion or other organisation, you need to know how they operate both within their “marketplace” and internally; if an individual, then you need to know a bit about their history and their personal life7. Having prior experience in the area in which they operate is extremely valuable, and will always give you a head start. Investigation with a view to undermining is akin to carrying out a crime, in that you are trying to do something that runs counter to the desires of the target. Anyone with experience of carrying out nefarious activities (whether strictly legal or not) will already have a fair grounding in the activity known as “scoping” (i.e. the research process), but if you have experience in preventing such activities (e.g. as a PR professional, or a security expert) this can be equally valuable, and in some cases moreso. Even if you don’t have personal experience it doesn’t rule out less complex, and far more common, types of undermining: someone with a sufficient Toolbox will be able to get along fine, and with practice become highly adept. •	How much time you have. I cannot tell you how much research to do and precisely what to look for – remember, it’s your investigation, or that of the group you are part of – but the more you do, the better your chances of success. However, if you need to get something out into the open very quickly, then you may be restricted in how much you can do, in which case always try and minimise the risk to yourself. Exposure is the nexus between public ignorance and public awareness. Essentially it is when something not previously known becomes known. It is a rather esoteric beast as the nature of that “something” could range from technical information to cultural knowledge right through to the physical manifestation of an undermining action. In most cases, though, exposure tends towards the earlier part of this spectrum, involving data and documentation rather than tactical openness, and as such could be considered a form of Execution in itself (see later). Regardless of the nature of that “something”, the exposure process is unlikely to be creating anything completely new: much more likely it is simply increasing awareness of that “something”, from perhaps just a few executives within a corporation to every member of staff, or from a few politicians to the entire electorate. In very few cases will exposure ever involve the fine details of the undermining process itself and certainly not the details of the people involved. Egotists do not make good Underminers. As demonstrated below there may be a case for describing how something is going to be done, but without jeopardising the Execution phase. Situations where details of what is going to be carried out are made public or (it makes my stomach ball up to write this) passed to the relevant “authorities” have almost always been in advance of symbolic activities such as legal marches and protests, where the outcome is certain not to undermine anything except the moral superiority of the people responsible for these activities. 1) In the case of information that has been purposefully withheld from the public eye in order to allow a destructive activity to take place, the leaking of such information is a situation where exposure is highly desirable. There may be decisions to make regarding the detail of the information leaked, how the leak is timed and who is involved, but ultimately the aim is to expose as widely as possible through the most effective channels before the information can be successfully refuted or covered up, the subject matter is no longer topical or the public simply lose interest. 2) An activity that requires a lot of individuals to take part in very many locations may intuitively be something that should be kept secret in order to reduce the effectiveness of any countermeasures, but in order to encourage as many people as possible to carry out the activity exposure may become an important factor in gathering support. The decision may be difficult to make, but in some cases advance exposure can be useful. The level of exposure must be carefully managed so as not to make undermining any more difficult than it may already be. It is a fine line, and may be a case of trusting your instincts. 3) More risky undermining activities tend to rely on early exposure being avoided, and in some cases the perpetrators will want to avoid any exposure at all. This could be to allow for repeated undermining of the same or similar targets using similar methods; or it could simply be to reduce the likelihood of the Underminer(s) being identified via indiscreet use of communications. In these cases reduced exposure leads to reduced risk. Sometimes exposure is just not part of the game plan at all and may be an unnecessary distraction from the activity itself, for instance when impeding the flow of disconnecting media such as political propaganda or corporate advertising. The fourth case implicit in this is when exposure is inevitable. To rule out the possibility of exposure in the planning process would be foolish, as no undermining activity is ever going to be completely airtight, however well you prepare. The rule of thumb is if exposure is not at all desirable then make sure you are prepared for the repercussions if it does happen. The next chapter will provide useful ground rules to help with this. In most cases this is the phase that culminates the undermining process. As suggested in the previous point, exposure can be a form of execution, but simply putting a document in the public eye is usually not enough in itself – something has to be done with that document for the undermining process to be effective. Thus, the execution phase is more than anything else the “action” part of undermining. This will be covered in a great level of detail in Part Two. At this juncture, though, it is important to understand the place execution takes in the whole undermining process, as it is often overstated or even considered to be the only thing that matters. In a very few cases it may be the only thing that matters, at least that’s how it will seem at the time. Let’s take the case of something that happened to me a couple of years ago, not initially intended as a piece of undermining but in the event turning out to be so. The story, which was reported extensively in the local press, was that I was on my way back from dropping my children off at school (yes, I know, but we’ve equipped them with everything they need to counter the institutional messages thrown at them) when I saw some hedge cutting taking place and stood in front of the machines for long enough to halt the entire process. In reality I heard the sound of chainsaws, thought about what might be happening, then carried on walking until it hit me that the chainsaws shouldn’t be there at all – it was June and birds were still nesting. I ran back to where I had heard the sound, saw a hedge lopping machine already having ripped the top third off 20 metres of hedge and stood in front of it, all the time shouting to the operator to stop. After a few discussions with the workers and their manager over the phone, the contract company agreed to stop the process until the council could come to a decision. The contractors left and I called the local paper. What then followed was a rash of photo ops and interviews, a front page article, a retraction by the council, a slew of disgusted letters to the local paper and those that reprinted the article, a follow up article saying a Friends of the Park group was going to be set up by the council, the cancellation of the entire project for two months and the cutting contract being rescheduled for all subsequent years, and that summer more birdsong than I have ever heard in all my years living around that park and more people using that small patch of green than I could ever remember. From an apparently spontaneous protest something had fundamentally shifted for an awful lot of people in the local area. Connections had been made. The undermining was not spontaneous. Some situations don’t allow for conscious thought, but they are not undermining situations. Pushing a child from the path of a car about to take her life; punching an assailant about to take your consciousness; fighting a security guard about to take your liberty: these are things borne out of necessity, and they come from deep within. Thought takes time, so you react and have to deal with any consequences later. Thinking back on that odd day it became clear that without having spent a long period of time in the company of road protestors I would never have considered running back and standing in front of a cutting machine; it would have seemed far too risky, whereas in reality I was never in any real danger, unlike the second generation fledglings due to have their nests ripped apart. The undermining came even later: insisting I was not going to move until the project had been cancelled and then calling up the press to publicise the actions of the council contractors and the necessary moves I had taken, they were even more deliberate, but both came from observing and taking part in other activities. Remember at the beginning of the chapter and the story of the cold frame? This was essentially the same. A plan that had been ready for who knows how many years had found its target and been executed with surprising success. The point is there is no such thing as the successful execution of an undermining activity without thought or planning. It may be your “gut instinct” that causes you to initially protect, halt, disrupt, remove or destroy something, but as an Underminer it will be that which came before which has turned that instinctive action into something with far wider repercussions. Execution is just one part of the process. • An office intruder carries a soft lint-free cloth with him. Some things can’t be avoided, so even with latex gloves there is the possibility of a small tear exposing a fingerprint. The thicker the gloves the less detailed the work possible and at some point it might be necessary to remove them, if only to pick up a dropped screw from between two carpet tiles. The cloth is to be wiped across any surfaces that may have been touched. • A logging saboteur never takes her tools home with her. The chainlink fence has to be breached with a suitable cutting tool, and the spikes that will end up causing no end of trouble for the sawmill aren’t going to sink in deeply without a lump hammer. The fence is retied as best as possible. As for the tools, burial is the only option; burial far away from where the operation took place, and far away from the home of the saboteur. • The administrator account has been compromised. The next move is not to access the data but to switch off security auditing; then the data can be siphoned from the system and onto a server umpteen hops and even more spoofed IP addresses away. With that done the log files are cleansed of any incriminating data; file access times are reverted and auditing is once again switched on. • An in-depth discussion between a courier and the post room supervisor reveals more than just the loading bay opening times. There is enough information gleaned to convince any suspicious staff member that the toilet renovations have, indeed, been carried out for health reasons, while they remain unaware of the hidden microphones just above the urinals. The press of a button and a blue light signifies the post room supervisor will remember nothing. So the last trick was blatantly stolen from the Men In Black movies and cannot – as far as we know – be executed quite so neatly outside of Hollywood8; but apart from that, all of these operations are essentially of the same nature. Some type of intrusive activity is covered up to reduce the likelihood of the perpetrators and ideally the nature of the intrusion being discovered. Housekeeping, as I mentioned earlier, is a vital stage in any undermining operation and must form part of the overall plan. Even the most hastily executed operations should include an element of housekeeping even if it’s just ensuring as few people as possible know the details, or making sure the mud on your shoes has been well removed prior to returning home. But housekeeping isn’t just a case of cleaning up after you. At all stages of any undermining operation you must be aware of your overall game plan. The adrenalin rush as you ascend in the elevator towards your quarry should not distract from the tactic of donning a fluorescent yellow tabard and using the back staircase on your way down in order to avoid being associated with whatever was carried out far above. Even such simple things as using the identification mask prefix when making a telephone call qualify as housekeeping. They are the details that get missed in the execution phase – the “fun” bit which can drown out the reason you are doing something in the first place in all your excitement. Did you remember to send Simone three telephone rings from the call box on the corner? You need to sit down together in the little alcove at that pub where there is always music, and the locals spend more of their time falling off the bar stools than actually staying upon them. Stage one may be complete but there is a whole lot more to do. For the moment, though, have a drink and celebrate your little victory against the system. 1 This is an edit of two essays by CrimethInc. Ex-Workers’ Collective: “There is a Difference Between Life and Survival”, http://crimethinc.com/texts/selected/difference.php and “Indulge…& Undermine”, http://crimethinc.com/texts/selected/indulge.php (both accessed October 2011). Reproduced with permission. The CrimethInc. website is a superb collection of literature, essays and thoughts on a wide range of subjects related to combating exploitation. 2 I’m now expecting this to appear on various websites as “clear evidence” of a desire to assassinate certain world leaders. Yeah, sounds like a great idea – I’ll start digging my grave now. 3 Except for perhaps basic intelligence which cannot be attained by effort any more than additional adult height can. 4 Sun Tzu (translated by Lionel Giles), “The Art Of War”, 1910. 6 “Ozymandiaus’ Sabotage and Direct Action Handbook”. Available from Reach Out Publications’ online archive (www.reachoutpub.com/publications.html) and various other locations. 7 The undermining of an individual is fraught with legal traps, and may also be morally unsound. An individual may “represent” something that needs undermining, but is rarely the thing that actually needs undermining. In many cases an individual may simply be a corporate martyr, such as a Head of Corporate Communications, resulting not only in wasted time and effort, but an individual who really didn’t deserve to be undermined, however poor their career decisions. In short, individuals are rarely fair game – rarely, but not never.